Microsoft's Steve Balmer recently suggested he may be ready to throw in the towel on the Zune line of music players. Not so fast there, pal � it takes more than 6 months to launch a fantastic product and make it stick - just ask Bill Gates. The Zune HD made its debut in September of 2009. It was head and shoulders beyond the previous Zune models, which were all discontinued upon the Zune HD's release. Microsoft has come up with more than just an MP3 player. For motorcyclists it's one of the lightest, smallest and most advanced devices for listening to music on the road and here are five reasons why. HD Radio: The obvious competitor to the Zune HD is the Apple iPod Touch. But you can't get any radio stations on it. Too bad, it's fun to listen to radio broadcasts in other towns as you tour. With the Zune you get all the FM channels, as well as all the HD radio broadcasts. I don't know about you, but when I'm staying in an area for a few days, I like to dial into the local radio stations and enjoy that part of the community fabric. I've enjoyed the Native American station that broadcasts from the Kah-Nee-Ta reservation near Redmond, OR; grooved to the late night jazz broadcasts out of the Tri-Cities and cried the blues while I wrenched on my bikes in the garage here in Seattle listening to the HD broadcast sent out by KMTT (blues format, different programming from their standard format). Channels: There's more than 100 channels of music you can dig into. As part of a $15 monthly Zune Pass subscription you can synch those channels to your player and carry the tunes around with you. You don't own them, but you get to listen to them for a week and can buy the tracks you want later. Smart DJ: This is a very cool feature. Once you set up the Zune HD software, it scans your media drives and logs the inventory (just like Windows Media Player). But as part of the monthly subscription, you get access to plenty of other tunes you don't even own. 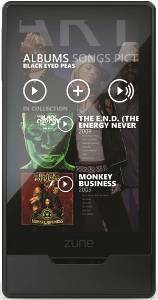 Using the Smart DJ option, simply type in a favorite artist and Zune HD puts together a lengthy playlist from your collection, and if you opt to, from their overall content as well. You can save the playlist and synch it to the Zune HD unit. It's a fantastic way to discover new music. Cost less than an iPod Touch, but it does a lot more - better! : It has a web browser, a place to store and run apps, lets you surf the web from anywhere there's a WiFi connection. The Zune HD's battery life is longer, charging time is shorter, screen is brighter and the unit is lighter. Uses both MP3 and the superior WMA format: I've been ripping my CD collection to my PC's media drive for about 6 years now. I have a ton of tunes saved in the WMA format. Why? It has better fidelity than the ancient MP3 format - a compressed format that has been around for more than a decade. If you like higher quality recordings, rip your files to the top grade setting in WMA and enjoy them in higher fidelity on your Zune HD player. If there's one downfall, it's the choice of apps. Since I'll be spending my time riding a motorcycle, futzing around with apps is the last of my worries. I did pull in the weather app which works just fine. So, Mr. Balmer, take a deep breath and keep forging on with the Zune HD. You've got something here. Rome wasn't built in a day and attempting to take over the market share that Apple owns will take a lot of time, marketing and convincing, but I'm convinced and looking forward to exploring hours of great music with my Zune HD. This is truly the first time Microsoft has come out of the gate ahead of what Apple is offering in this arena. I'd like to see MS make a commitment to staying ahead with every Zune release from here on out. As this story went to press Microsoft announced a firmware upgrade and five additional new features for the player will be included in that upgrade. Obviously, Balmer knows what he's got here and isn't throwing in the towel. For more information, visit the Zune website.